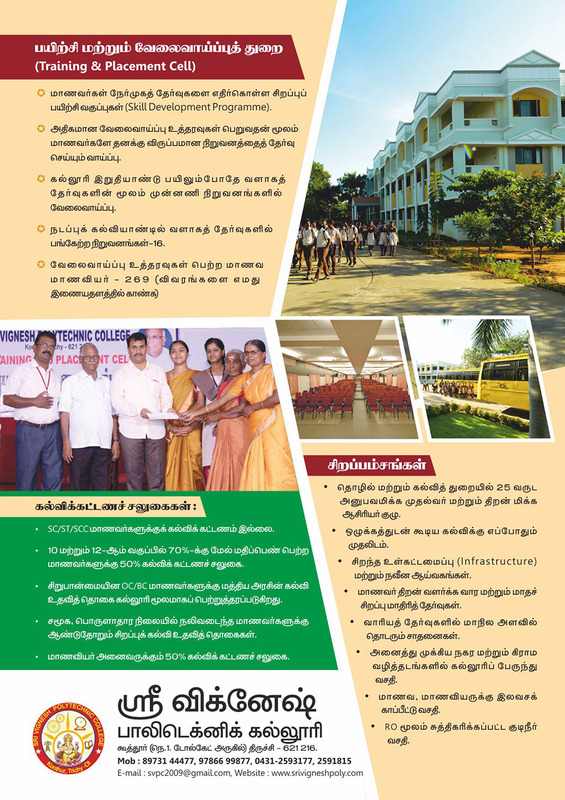 Welcome to Sri Vignesh Polytechnic College, Our Sister Concerns: Vignesh Flats Housing Promoters, Vignesh Constructions, Vignesh Sri Renga Matriculation Hr Sec School, Sri Vignesh Vidyalaya Senior Sec School(CBSE), Koothur. Sri Vignesh Public School (CBSE), Woraiyur. Vignesh Residency, Srirangam Trichy. GR Chits Pvt Ltd at Palakkarai & Srirangam Trichy. October - 2018 அரசு வாரியத் தேர்வுகளில் 700-க்கு 700 மதிப்பெண்கள் பெற்று மாநிலத்தில் முதலிடம் பிடித்த ECE மாணவி! We, the guider of your career! Vision of Sri Vignesh Polytechnic College is the vision of its founder Late Sri.D.Virudhachalam.